Manual transmission clutch forks (basic part number 7515) are the link between the external clutch linkage and the throw-out bearing, providing the lever that engages and disengages the clutch. It's not widely known that the clutch fork used in 1970 is unique to that year -- note the D0OA-A casting number on the top fork in the picture below. 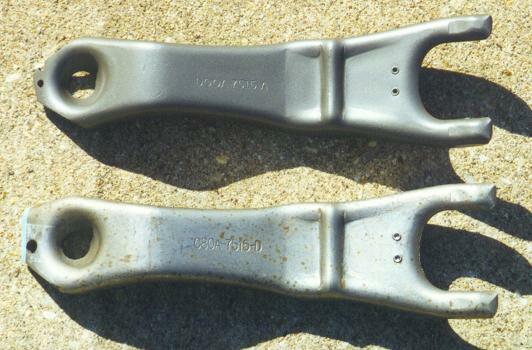 The 1968-1969 fork has a C8OA-D casting number. Though both of the forks below can be used with 428 CJs from all three years, the 1970 piece is readily recognized by its unique spring mounting end (which is visible when installed). 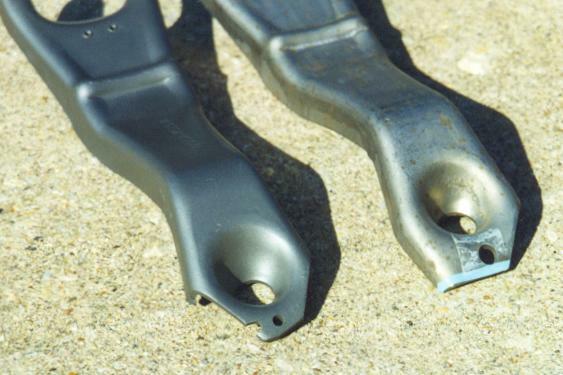 Here's a more detailed view of the spring mounting end (below), showing the 1970 fork on the left and the 1968-1969 fork on the right. Regarding the '70 fork, Brian McDevitt of Ford Muscle Parts has told me that "I have taken apart more of those cars than I can tell you right now. I have never seen that fork in one of the 70 Mustangs or Cougars. I saw them in every 429 CJ/SCJ Torino Fairlane and Cyclone I ever parted. I currently own a '70 SCJ Mach with 6700 original mile car built May of 70 and it has the C8OA fork in it.". The applicability info I've described here is listed in the 1975 Master Parts Catalog, which does indeed list the '70 fork for the 1970 Torino, Fairlane, and Cyclone equipped with a 429 engine in addition to the 1970 428 Mustang application. It may well be that the MPC is wrong about the 428 Mustang, or it could be that both forks were used during the 1970 model year. Additional insights are welcome.